Hillary Slams Facebook For Election Fake News [VIDEO] - Joe.My.God. 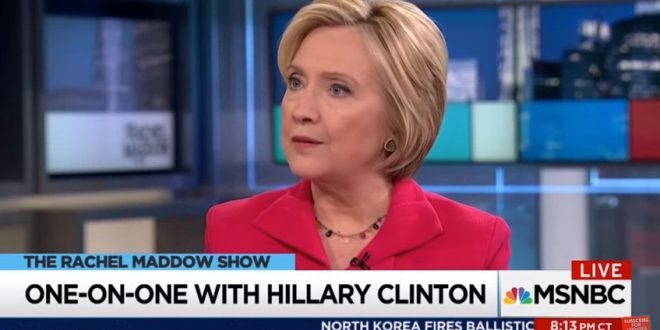 During her appearance on last night’s Rachel Maddow Show, Hillary Clinton took aim at Facebook’s role in spreading fake news during the 2016 election. “We may have our disagreements among Americans, we’re not going to let the Russians come in and divide us. And so we’re going to make Facebook own up to everything. They’ve just begun to own up. They have a long way to go before they get to where they need to be, in my opinion,” Clinton told MSNBC’s Rachel Maddow. “Other tech companies, we’re going to go after these provocateurs, these Russians posing as Americans, these content farms in Macedonia, these thousand trolls, these tens of thousands of bots, because you know what, we have every right to have a rigorous debate in America, but we don’t want it being interfered with and suborned by Putin and his allies,” she continued. Last week Facebook revealed that hundreds of Russia-based accounts purchased ads that promoted various anti-Clinton conspiracy claims.